Low Resistance Standards - 100-0 Ohm Standard | Ohm-Labs, Inc.
Ohm-Labs' 100-0 Zero Ohm Standard is a four wire zero ohm reference for verifying long scale multimeters, micro-ohmmeters, or other equipment requiring a true, short-circuit check. 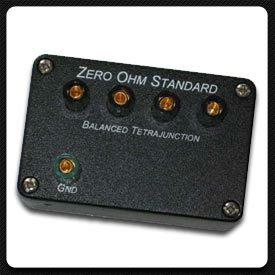 Zero ohms in any connection configuration is achieved by using a tetrajunction. A tetrajunction is an ideal connection of four wires, such that current passed through any two creates no potential drop across the other two. Based on work performed by B. V. Hamon and others at NIST (formerly NBS), a 'copper disc and post' construction was evaluated, and subsequently commercialized in Leeds & Northrup's Hamon Transfer Standards. Verification of the 100-0 standard can be performed by passing current through various pairs of terminals and noting the potential at the remaining pair. The 100-0 is factory adjusted to less than 50 nano-ohms in any connection configuration. The tetrajunction will not measurably drift over time. The binding posts are of gold plated, low thermal emf tellurium copper. A case ground is provided for reduction of electrical interference.